The summer is flying by, I can’t believe it is August already. We are still enjoying the hot summer sun and temperatures in Utah. To cool down, I made a special beverage, strawberry limeade. It is very refreshing and so simple to make. Josh was working hard on our kitchen remodel and I sensed he needed a break, so I brought him a tall glass of strawberry limeade. We enjoyed our drinks on the front porch. We love sitting outside. We are lucky our house gets a nice canyon breeze. It is also fun to watch the neighborhood families walk, run, bike, and scooter around the neighborhood. We also have some of the cutest dogs in our neighborhood. It was nice to relax and slowly sip our strawberry limeade. We are trying to enjoy every last bit of summer we can and this beverage did the trick. 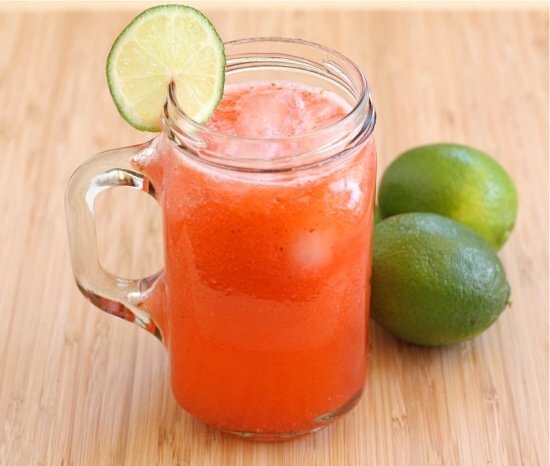 This strawberry limeade is a little sweet and a little sour with fresh strawberry puree in the mix. Use fresh lime juice and the sweetest strawberries you can find. 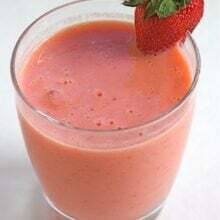 It is the perfect summer drink for adults and kids. 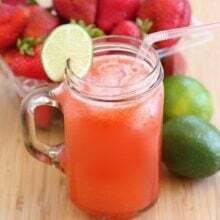 Make a big pitcher because everyone will want to cool down with a special strawberry limeade drink. Cheers! I could go for some right now! Looks yummy! I really like the color. That looks AMAZING!!! Can’t wait to try it. That looks so refreshing!! Perfect for these 90 degree days we are having! Maria, this just looks wonderful- perfect for hitting the spot on this hot August summer afternoons! 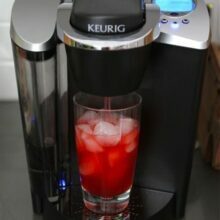 This would be great for a Bear Lake sipper. Thank you! This looks so good Maria!! 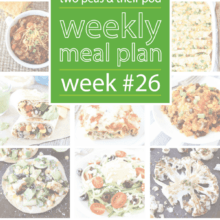 I am tempted to make this right now!! So great for the summer and I love those mugs. Perfect for the pretty pink drink! I would kill for one of these right now. This humidity is going to be the end of me… but I bet this limeade would help cool things down. Beautiful pictures! Delicious and so refreshing! That combo is heavenly! Delicious! I love fruity summer drinks and this looks and sounds so refreshing! TCB sent me over here, but I’m afraid I have to leave now. You see, I’m pregnant and craving everything. But I’m also on bed rest. So your lovely site is making me want to get up and bake cookies and zucchini french fries and black bean salsa. I’ll be sure to bookmark you and come back later when I can actually do something about all these cravings! …..Mmmmmm, I’m hungry now! Despite a couple of my most recent posts having to do with lemons and even a lavender lemonade; I love limes. 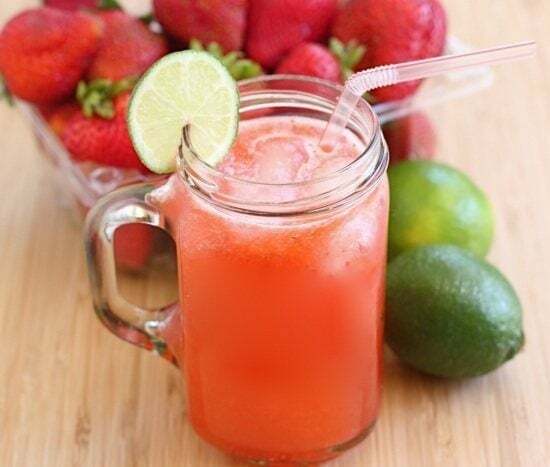 Given the choice between lemonade and limeade; I go green every time so this looks especially appealing with my favorite citrus combined with strawberries. So refreshing I love it! Perfect for August picnics. I am a fan of anything with strawberries. This not only looks refreshing but I love the color as well. I am going to try this one out on my kids. 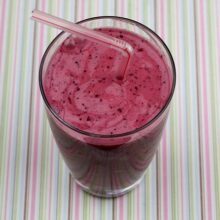 This looks tasty and so refreshing – yum! Oh this sounds so ridiculously refreshing. I’m much more a lime fan than a lemon fan. Need to make this! I LOVE limeade! I know I would go gaga for this. We’re dying in the heat today (finishing up the re-wiring in the master bedroom) and this sounds so good. Love the color, looks like summer in a class! Sounds perfect to me. Our temps hit high 90s again today and a cool, fruity drink would hit the spot. I have never in my life had real strawberry limeade. It looks heavenly! As soon as I saw this I knew I had to make it asap! It was delicious! I did substitute agave nectar for the sugar (I don’t like super sweet drinks). It was still so refreshing and tasty! I always prefer limeade to lemonade for some reason… and your version looks lovely! I could use some right now… We’ve had quite a bit of hot and sticky weather. This looks so nice and refreshing! LOVE these summer flavors. I love that first photo, Maria! This looks so easy and refreshing. I wish strawberries were in season here, that looks so good! Great photo – wow! This looks so sweet and refreshing, perfect for a hot summer day…LIKE TODAY! It’s so humid here right now, so this sounds wonderful! I have so many strawberries in my freezer right now since my grocery store always seems to have them on sale. This will be a good way to use some up! My favorite! I can’t wait to try them. Beautiful photos too. Ooh this looks so refreshing… a nice change from lemonade! LOVE, love, love the new look….and the limeade! This looks delicious and refreshing. Perfect for a hot summer day! Love the new look of the blog! Great picture of you and Josh! Can I come over and get some? Your new site is totally gorgeous! SO much happier about your new feed allowance! it now shows full feeds in g.reader! yay!! Your new design looks beautiful! I love it and I love limeade…and with strawberries? Hello, yum! Yum, I would love to try a batch of this! We could really use a tall glass of this over the last few days! It’s been so hot and humid here in Georgia. Your site’s redesign is really pretty. Love it! I can’t wait to try it! Thanks for your recipes! Cute mug! Where did you get them? Ohhh that looks divine! Those glasses are adorable, where did you get them? I love lime anything and I have all the ingredients right now. Looks like I’m going to be making something yummy. Hello! I am a frequent reader of blog comments and internet reviews, but rarely am I inclined to add my two cents. However, I find myself compelled to tell you, Maria, that this drink is oh so delicious and refreshing, and I will make it again! It’s also perfect for those times when you have more limes and strawberries than you know what to do with and don’t want them to go to waste. Thank you for sharing! i just posted a limeade based on this one of yours. It´s so refreshing, me and my daughters loved it! Thank you for sharing. This tastes like a strawberry margarita. Pretty good! Smells bad when you mix it though, don’t let that discourage you. It’s almost strawberry season. I am so going to make this! Thanks for sharing.